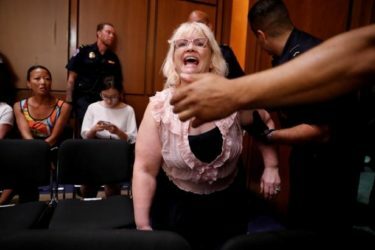 A protester during Supreme Court nominee Judge Brett Kavanaugh's confirmation hearing is removed by security Tuesday. 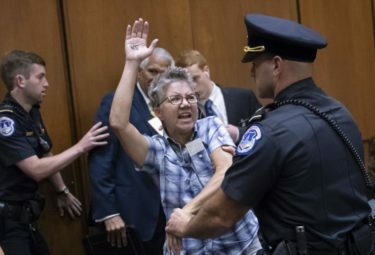 Capitol police arrested 70 people for outbursts and disruptions during Kavanaugh’s hearing Tuesday – and the protests continued during his testimony Wednesday. The protests were so frequent at times that Wednesday’s hearing assumed a decidedly halting cadence as Republican senators expressed frustration at the interruptions. On Wednesday, police temporarily closed off the hearing from additional spectators at one point, leaving some seats empty. Protest organizers [claimed] their intentionally disruptive strategy [is] vital to preserving civil rights and democracy. They described Kavanaugh’s views on women’s rights, LGBT rights and health care as extreme and decried Trump’s authority to nominate him. Soon after the Kavanaugh hearings were scheduled, the Center for Popular Democracy Action worked with other advocacy groups, including the pro-abortion progressive groups Women’s March, Ultraviolet and NARAL, to urge supporters to flood the capital, Epps-Addison said. Rachel O’Leary Carmona, chief operating officer of the Women’s March, confirmed that her group had coordinated a plan to disrupt the hearings. That included offering lodging to traveling protesters and “jail and bail support” if necessary. Republicans have called Kavanaugh an experienced jurist, a reasonable person and a good man worthy of confirmation. They blasted the disruptive protests as inappropriate. The protesters were given tickets but had braced for worse, Epps-Addison said. Other groups also have garnered attention for their protests, including silent protests and other sensational rallies. Liberal advocacy organization Demand Justice organized a group of women dressed as handmaids from the television show “The Handmaid’s Tale” to stand quietly in the hallway, signifying their belief that Kavanaugh’s appointment would suppress women’s reproductive rights. From USAToday .com. Reprinted here for educational purposes only. May not be reproduced on other websites without permission from USAToday. 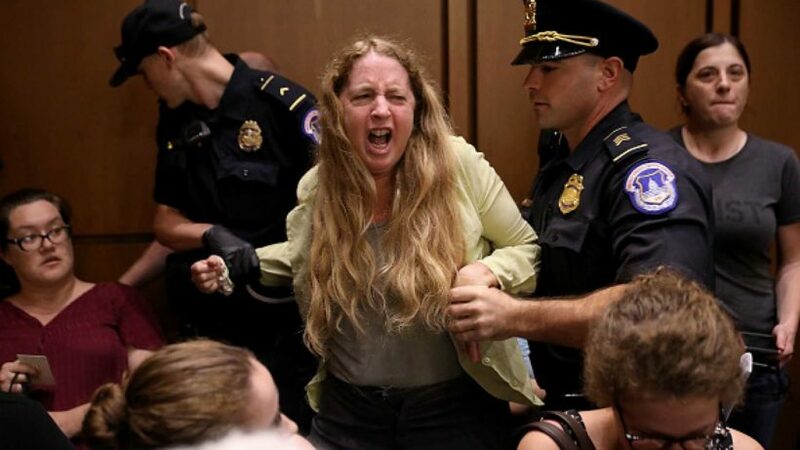 2. a) How many protesters have been arrested for disrupting Brett Kavanaugh’s Senate confirmation hearings? b) Why did police have to temporarily block more spectators from viewing the hearings on Wednesday? 3. 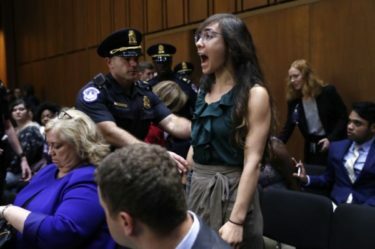 What is the protesters’ reason for continually disrupting the hearings? – Why do they want to shut down Kavanaugh’s Senate confirmation hearings? 4. How did Jennifer Epps, head of the liberal Center for Popular Democracy Action, explain the protests? 5. What do you think is the goal of the protesters? 6. a) What is the purpose of Senate confirmation hearings for potential federal judges? 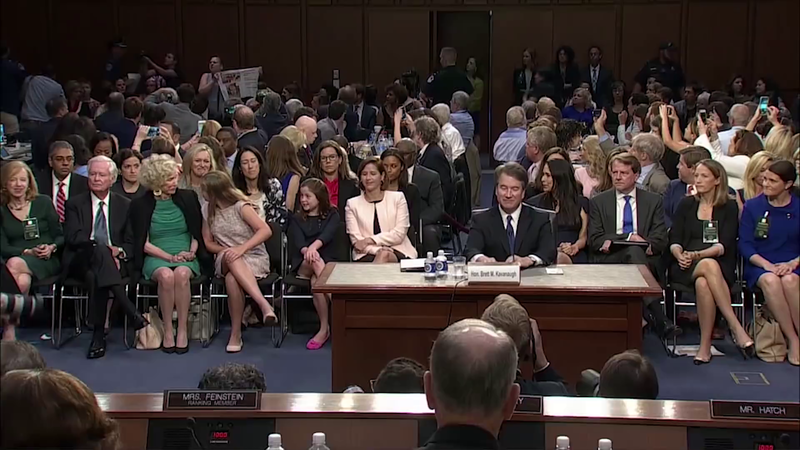 b) Do you think the Senators should vote against Kavanaugh based on these protesters’ opposition? 7. President Obama nominated and the Senate confirmed two Supreme Court Justices – Sonia Sotomayor and Elena Kagan. Conservatives opposed the nomination of these two judges, but they did not shout down, disrupt, and otherwise impede the confirmation process. Why do you think conservatives do not use tactics to disrupt, break up, shut down, silence people/ideas with whom they disagree? Think about the role of a judge. Do you support the nomination of judges that practice judicial restrain or judicial activism? Explain your answer. 9. 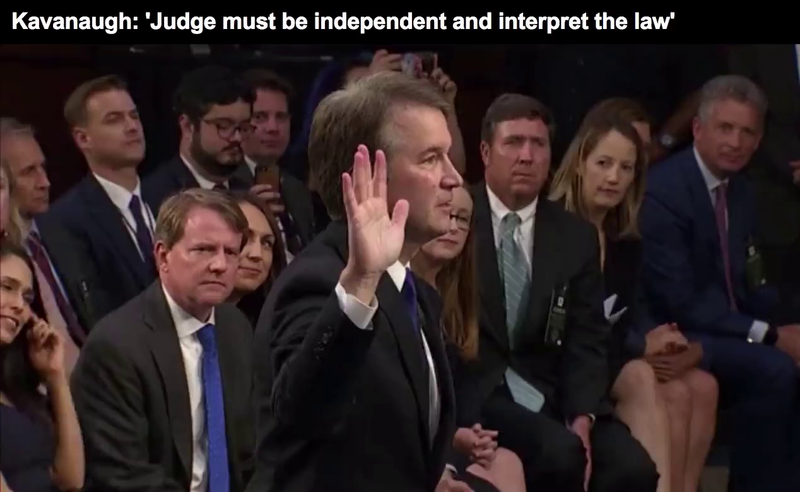 Read the Background and watch the videos under “Resources.” What type of judge is Brett Kavanaugh? Do you think he would make a good Supreme Court justice? Why or why not? Explain your answer. 10. a) What two adjectives would you use to describe the protesters? Explain your answers. b) What two adjectives would you use to describe Judge Kavanaugh? Explain your answers. c) What two adjectives would you use to describe the Democratic senators and the Republican senators in the hearings? Explain your answers. A good judge must be an umpire—a neutral and impartial arbiter who favors no litigant or policy. As Justice Kennedy explained in Texas versus Johnson, one of his greatest opinions, judges do not make decisions to reach a preferred result. Judges make decisions because “the law and the Constitution, as we see them, compel the result.” Over the past 12 years, I have ruled sometimes for the prosecution and sometimes for criminal defendants, sometimes for workers and sometimes for businesses, sometimes for environmentalists and sometimes for coal miners. In each case, I have followed the law. I don’t decide cases based on personal or policy preferences. I am not a pro-plaintiff or pro-defendant judge. I am not a pro-prosecution or pro-defense judge. I am a pro-law judge. As Justice Kennedy showed us, a judge must be independent, not swayed by public pressure. Our independent Judiciary is the crown jewel of our constitutional republic. In our independent Judiciary, the Supreme Court is the last line of defense for the separation of powers, and the rights and liberties guaranteed by the Constitution.